It’s a miracle!! I made the bread on time! And what fabulous looking bread it is too. I’m so thrilled with the oven-spring. The deep crevices from the slashes disappeared entirely, creating an amazing contrast to the heavily floured outside! This bread made with all-purpose and whole wheat flours as well as a small amount of rye flour, was baked under a dome for the first 30 minutes. Talk about a steam chamber! Sure, it looks like a soccer ball. But it doesn’t seem like it’s is going to bounce across the kitchen floor. Monday 14 May 17:21: I just realized that it’s almost 16th. Duh. I guess I’d better get cracking. EEeek!!! I can’t be missing yet another BBB deadline! I’d better get started! I’m a little concerned about WHAT I’m going to bake this bread in. T has nixed me using the clay baker because I made the mistake of telling him that Karen’s bread had stuck to the bottom of her Römertopf…. Oops. The others mentioned that this makes A LOT OF DOUGH, so I’m going to make half the recipe. There has been a lot of discussion about putting that dry and cold earthenware pot in a preheated hot oven […] I know you’re not supposed to do that. I’ve been doing it every time I bake bread in this thing and there has been no cracks nor explosions. Disclaimer: my pot may not be your pot and no, I won’t replace yours if/when something unspeakable happens. =:~0 I’m not sure but I think wetting the inside of the cover may help preventing cracks?? I still don’t know what I’m going to bake the bread in. I have a large pyrex covered casserole dish; I wonder if that would work. 22:02: I have no mind!! I just remembered that I had decided to make the starter tonight after dinner. (Yes, I know; it’s still after dinner now….) Luckily, making a starter doesn’t take too long. And because the others murmurred something about this making lots of bread, I decided to halve the recipe. Tuesday 05:09: WHAT am I doing up so early?! Oh yes… it’s to mix bread dough. I just realized that I managed to forget to add sugar to the starter last night. I wonder if that will make very much difference to the outcome. I also added a little less yeast. Maybe I should venture into the kitchen to see what has occurred overnight. My fingers are crossed that I’ll see plenty of bubbles. 05:59: Why is it that I ever doubt yeast? Of course there were bubbles in the starter. Bubbles galore. And so, I got out the scale again – I love to weigh the ingredients – and began mixing the dough. But. The recipe we’re using this month is from a book that uses cup and spoon measures. Even though Karen did say how many grams of flour she used. But I thought I’d check my scooping skills. And very interesting results there were too. The first cup of all-purpose flour that I scooped out and weighed was 141gm. The second cup weighed only 128gm (yes, I used the same cup). I then weighed a half cup of whole wheat flour – I’m incapable of making 100% white flour bread. That half cup of flour was 56gm. Beth Hensperger’s half-recipe calls for 2.5 to 3 cups of flour. I decided to hold back a half cup. But I measured it anyway, just in case I wanted to use it. The final half cup of flour weighed 64gm. How interesting that I managed to get the same weight per half cup of all-purpose flour after weighing the first cup. But still. There’s quite a difference between 70gm and 64gm when they are multiplied by 5 or 6. See why I prefer to measure by weight? That way, the only variables I have to deal with are temperature and humidity. I noted that the recipe calls for a good shot of olive oil. Keeping the inadvertant decision to omit the sugar entirely, I made another executive decision to use only a quarter the amount of oil. The kneaded dough is now proofing in the oven with only the light turned on. I think I’ll jump back under the covers now to sleep a little longer and get up at a reasonable hour. 09:32 I can’t believe how much the dough rose! And Karen is right. That is STICKY dough! Shaping was easy though. I was extremely prodigal with flouring the outside of the loaf (but duh… I forgot to spray it with water first). 10:25 The bread is in the oven now… wish me luck! 10:38 Oh oh. Am I going to be able to remove the cloche? The bread has spread out to meet the walls. 10:59 Whoohooooooooo!! The lid came off with no difficulty at all. How silly of me to worry. And talk about oven spring! Wow. When I showed T the bread, he was as thrilled as I about how much it popped. He says it’s the most beautiful bread I’ve ever baked! me: Let’s have lentil soup! he: [looking horrified] Lentil soup?! NO. Meat! We need meat! It’s beautiful outside. And we have some coffee barbecue sauce left still. Let’s barbecue. And so we jumped on our bikes, stopping at the vegetable market to get some beautiful looking broccoli and then headed to the butcher’s shop to get some pork shoulder. It’s marinating now. I can’t WAIT for dinner so I can see what the inside of this bread looks like! actual dough Early the next morning, admire the bubbling starter. Then, using a wooden spoon, beat the starter briefly. Put some of the warm water into a small bowl and whisk the yeast until it has dissolved. Pour the rest of the warm water and olive oil into to the starter and beat well. Dump in all the flour and the salt, leaving about 0.5 cup flour aside and stir well until the flour is absorbed and the dough starts to clear the sides of the bowl. Stir in the yeasted water. kneading Scatter a very light dusting of flour on the board and turn the dough out. Now wash and dry the mixing bowl; this cleans your hands AND allows the dough to rest. Knead for 5 to 10 minutes until it is soft and silky. Try not to add too much extra flour. Place the kneaded dough into the clean mixing bowl and cover it with a plate. (Hensperger’s recipe says to put the dough into a floured deep container, dust the top with flour, and cover with plastic wrap.) Allow to rise until it has tripled. I put the bowl into the oven with only the light turned on; it took about 3 hours for the dough to rise. baking Turn the oven to 400F, making sure the rack is in the center of the oven. Cloche instructions: Sprinkle the dish with flour and place the dough ball in the center of the dish. Move the dough around to cover the bottom and up the sides a bit with flour. before placing in the oven, rinse the inside of the cloche bell with water, draining off excess drips. Put the cloche over the bread and place in the preheated oven. Bake for 10 minutes. Turn the oven down to 375F and bake a further 20 minutes more. Remove the cloche and bake 10 to 15 minutes more til the loaf becomes golden and the internal temperature is around 210F. 1.) Sugar: I didn’t leave the sugar out on purpose. I really didn’t. I had intended to use less than the recipe called for and then because of the late hour, I simply forgot to add it. 2.) Oil: The recipe calls for 4Tbsp of oil. Irritatingly, I am having to drastically restrict my fat intake right now, so I decided to use just 1 Tbsp. I did consider omitting it entirely but then decided the bread wouldn’t be even close to the same as the other BBBs’ Shepherd Bread. 5.) But I like warm bread! : If you wish to serve warm bread, reheat it after the loaf has cooled completely. To reheat UNsliced bread, turn the oven to 500F for 5 minutes or so. Turn the oven OFF. Put the bread in the hot oven for ten minutes. Thank you, once again, Karen! I can’t wait to taste this bread! I suspect we’ll be making it again and again. this is seriously goodlooking very good tasting bread! We are baking not as much a novel recipe instead we -or at least I- am revisiting a method which I really like but can cause some discussion or frustration…. Discussion because oh horror! we’re instructed to put a COLD cloche in a hot oven. Yes it works, No it won’t break. Yes I know you’re not supposed to do that. Discussion over? Frustration because arrgghhh we’re instructed to heavily flour the cloche….. I’m using my mom’s old Römertopf. The inside is so smooth and there’s this pesky indentation in the bottom both of which will cause my loaf to stick no matter what or how. So I’ll use parchment. Bye Bye screwdriver to get my bread out. Thank Heaven for parchment paper! There is no way that I’d have been able to heavily flour our pyrex casserole dish…. We know that you too will WANT to bake this bread!! To receive a Baking Buddy Badge to display on your site: bake Shepherd’s in the next couple of weeks and post about it (we love to see how your bread turned out AND hear what you think about it – what you didn’t like and/or what you liked) before the 29 May 2012. If you do not have a blog, no problem; you can also post your picture(s) to Flickr (or any other photo sharing site) and record your thoughts about the bread there. Please remember to email the Kitchen of the Month to say that your post is up. Karen, Bake My Day (kitchen of the month): Bread Baking Babes; Shepherd’s Bread; The Babes have Buddies; Shepherd’s Bread in a pot, the round-up! Katie, Thyme for Cooking: Shepherd’s Bread – The Babes do it Again! Traditionally baked in a cast-iron pan submerged in a small, ember-lined pit covered with dirt. It is easily adopted to conventional home ovens by baking it in a contemporary clay cloche, a cast iron Dutch oven with a tight fitting flanged lid, or on a pizza stone. This Basque bread is a relative of the simple Spanish and Greek peasant loaves of Europe. I completely forgot to ask Karen how to bake the bread in an ember-lined pit. Wouldn’t that be a kick to do? Remind me to call the gas company before we dig the hole in the back yard…. This entry was posted in baking, BBBabes, bread - yeasted & unyeasted, bread recipe, food & drink, posts with recipes on Wednesday, 16 May 2012 by ejm. Amazing isn’t it, such simple bread and we get super excited seems no matter. And yes well that oven rise does take your breath away! And so do those slashes don’t they. Doubt, you doubt yeast still? Yes I do really love the scale but more and more it seems strange to worry about it too very much. I mean look what happens, you forget to add a 1/2 cup sugar and you still get spectacular bread! Gorgeous bread Elizabeth! It’s good to read that this one behaves equally well without that humongous amount of sugar in the dough. I bet T will let you use his precious clay baker now? Using parchment of course ;-). One of my boys always claims we need to have soup when he sees this kind of bread emerging from the oven, preferably a creamy kind like mustard or mushroom. I’ve seen it happen quite a few times now, but I’m still in love with that ovenspring and the way the slashes kind of disappear while they’re still there. Hmmm I think I need to bake today! Of course not, Karen!! Actually, we both agreed that it would be disastrous if our clay baker cracked. We use it too often to bake chicken or jerk pork. Mmmmm, soup…. Having tasted the bread, I STILL think soup is the best for it. Mushroom would be great. I’ve never had mustard soup though. I’m intrigued! Lovely loaf! We really enjoyed this one too – I love your shaping, great looking crust too! I have a cloche – that I used to bake bread in…. but I’m not sure it would FIT in my current oven. I always used cornmeal – and the bread still stuck… Parchment paper – who would have thought…. Well done, as always – and en entertaining read. Elizabeth….. get your shovel and start digging! The ember pit instructions are in the comments on my blog…..
That is a REAL beautiful loaf. That ovenrise is just amazing. I love it when breads do that! Good to know the sugar can be left out.Even though I used the sugar, it didn’t really taste sweet. I think your cloche is real creative thinking, never knew pyrex came is such a huge shapes. I didn’t know that pyrex came in such huge shapes either, Lien. I was thrilled when I saw it at the store and grabbed it. It’s my favourite mixing bowl – perfect for proofing dough that has to triple in size. Thank you, Natashya. Next time, I’m planning on trying crisscross slashes – I had a devil of a time photographing this bread. It looked so stripy. The crumb is quite compact on this bread, isn’t it? In fact, it will make perfect sandwich bread. In retrospect, I think this would have worked out better with lentil soup after all. Not that it wasn’t delicious with barbecued pork! And it could have used more salt. I wonder if an extra 2 gms would have done it. Katie, you must get hold of some parchment paper and bake this bread. Just make sure to put in enough salt. Thank you, Karen! I’ll just call the gas company before I grab the shovel. …I wonder if we need to worry about all the trees in the back yard too. I loved this bread and love how yours came out too! Under the heading ‘actual dough’ you mention to stir the 0.25g tspn of active dry yeast into warm water. Is this the same 230 grms warm water that you used the night before in the ‘starter – overnight rise’? OH dear! It’s an additional 120gm warm water. Thank you for pointing out the error, Yvonne! I’ve corrected it in the post now…. It IS good bread, isn’t it Astrid? I do think it benefits from having the starter go overnight though. Love your happy loaf! I used much less sugar and like it just fine too. Great toast and sandwich bread. What a great post! such fun to read… I only made half as well and still had a large loaf. I measured everything out with a scale like you but tend to go by feel when it comes to the flour. I live in high altitude with dry conditions so I usually need less flour than stated. What a gorgeous ‘puffball’ of a bread – so impressed with that oven spring and lovely scoring! 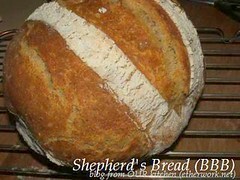 Thanks again for your kind comment about my Shepherd’s Bread.